65:00 live performance for independent low-watt FM transmission. Incorporated into Trilogy for Night and Radio. 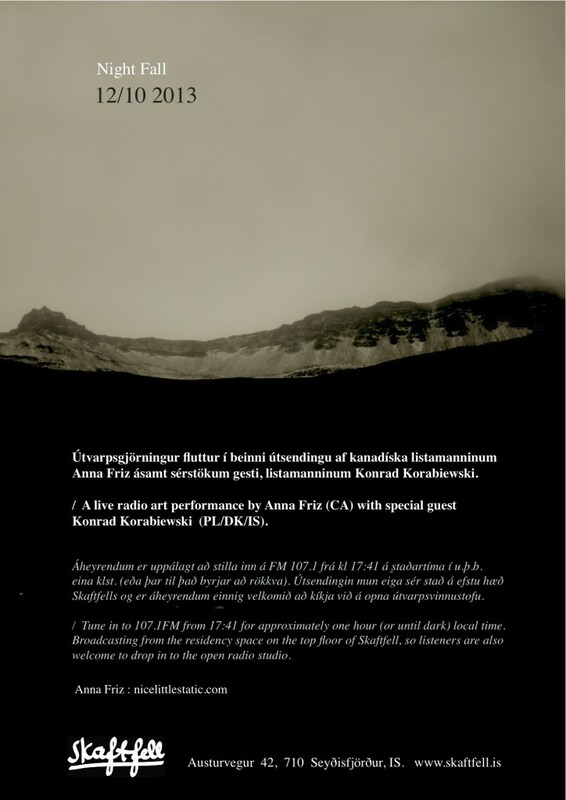 A live radio art performance created with Konrad Korabiewski (PL/DK/IS). Anna has been transmitting the radio art beacon Radiotelegraph from 7.-11. October at sundown, simulcast on low-watt FM radio to Seyðisfjörður, east Iceland, and to the experimental radio platform Radius in Chicago. The beacon signaled the descent of the sun into the northern night, using spoken morse code, electronics, and shortwave signals. Night Fall expanded the sonic palate to include other homemade and lo-fi electronics, and an integrated feedback and re-sampling system between the artists. The improvised live show for unlicensed transmission covered the town, and invited the audience to contemplate the acoustic and electro-magnetic landscape of Seyðisfjörður at dusk. Broadcast on 107.1FM from 17:41 for approximately one hour (from sundown til dark) local time, from the residency space on the top floor of Skaftfell Center for Visual Art.